How to find the surface area of a cylinder? What's the surface area of a cylinder formula? the total surface area of a cylinder. A cylinder is a three-dimensional solid that consist of two congruent surfaces (bases) and one lateral surface. Although cylinders may take many various forms, the term cylinder usually means the right circular cylinder. Our surface area of a cylinder calculator is dedicated to this type of cylinders. Cylinder is right when one of its bases lies exactly above the other base and oblique if it doesn't. It is worth mentioning that the base of a cylinder can be any plain, closed surface, e.g., a circular cylinder has a circular base, and a rectangular cylinder has a rectangular base. Keep reading if you want to learn what is the surface area of a cylinder formula and how to find the surface area of a cylinder. You may also want to estimate other parameters of a cylinder - just check out our right cylinder calculator! To estimate the surface area of a cylinder, you need to visualize it as a net. It is as if you open the cylinder just like a carton box and then flatten it out. Use your imagination! And what will you get? The answer is that a right circular cylinder consists of two circles and one rectangle, as you can see it in the figure below. Therefore, the base surface area of a cylinder equals two times area of a circle with the radius r, and the lateral surface area of a cylinder is the area of a rectangle. 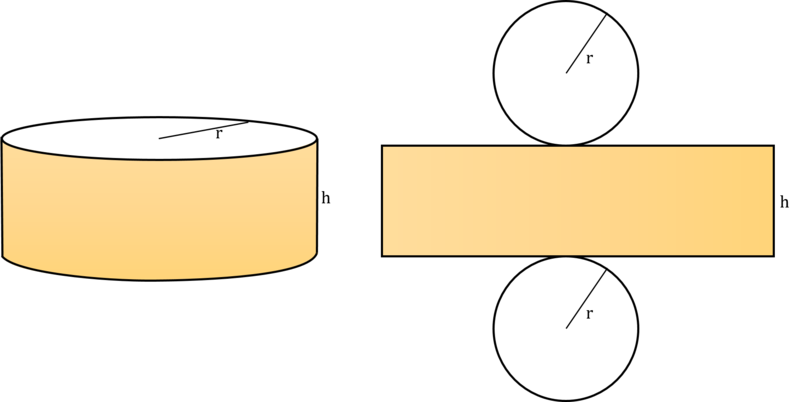 The first side of this rectangle is the height of the cylinder h and the second is the circumference of the base 2 * π * r.
h is the height of a cylinder. or total_area = 2 * π * r * (r + h). With our surface area of a cylinder calculator, you can perform all the calculations in many different units. If you want to learn more about area unit conversion, check out our area converter now! In the advanced mode of this calculator you can also calculate the volume of a cylinder. The interesting fact is that every cylinder with the same heights and base areas has the same volume. It doesn't matter whether it is a right or oblique cylinder. 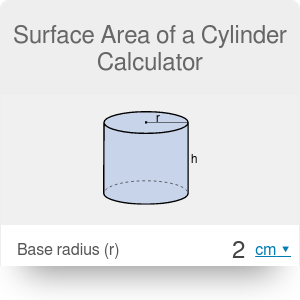 Surface Area of a Cylinder Calculator can be embedded on your website to enrich the content you wrote and make it easier for your visitors to understand your message.